We are used to the idea of young people going through an identity crisis, but imagine what it must be like for 60 year old Sookie Poole of Point Clear, Alabama when it happened to her. And it wasn't just because she finally got all three daughters through their weddings and was faced with empty nest syndrome. Instead, Sookie's crisis came first in the form of a phone call, followed by an envelope addressed to her mother, Mrs. Lenore Simmons Krackenberry, from the Texas Office of Public Health Services. In it, was a letter from a woman in Mexico, and some medical records and...Sookie's adoption papers. Adopted? Sookie is floored. And she does not want to deal with this. But eventually, circumstances, her husband Earle's support and her own curiosity lead Sookie on a journey of discovery that takes her back to Stanislaw Jurdabralinski, a Polish Catholic immigrant who settled in Pulaski Wisconsin in 1909, married a woman named Linka and had one son, Wencent called Wink, and four daughters, Fritzi, twins Gertrude and Tula, and lastly, Sophie. Well, Stanislaw Jurdabralinski opened a filling station in Pulaski in the 1920s called Winks Phillips 66 and all the children had to help out. They were a family that couldn't be any more different than the "genteel" Krackenberry's, who belonged to only the "right" organizations and only socialized with the best people. And yet, it was a world Sookie never felt at home in. Back to the Jurdabralinskis. In the 1930s, flying was still quite a novelty and skywriting was a popular way to advertise. In 1938, the people of Pulaski were expecting a skywriter and cleared land behind Winks Phillips 66 for the plane to land. When Billy Bevins finally arrives, it is quite special, but then he asks Fritzi out for a date and flies her to Milwaukee. Fritzi is imediately hooked on flying and soon she is flying and doing aerial stunts, including wing walking, with Billy. But how did Sookie end up being adopted in Texas? When the Second World War broke out and the US finally entered it in 1941, Wink enlisted in the Army Air Corps during WWII, so when Stanislaw develops TB and has to go to a sanatorium, the girls take over the filling station, even learning about the mechanics of automobiles. It is a successful enterprise, but with gas rationing, they eventually have to close it down. Fritzi wants to do her bit for the war, but she isn't satisfied with something like factory work, so she applies to the Army Air Corps. She is turned down, but when the Women's Army Auxiliary Corps, or WAAC, is formed, Fritzi goes off to Texas to ferry planes for the armed forces. Eventually, Gertrude and Sophie follow in her footsteps, so for a while, there are three Jurdabralinski sisters in Texas. But which one was Sookie's mother? As long as you don't read ahead, I think you will get a genuine surprise at the end of the book when you discover the answer to that question. I haven't reviewed an adult book on this blog in a long time, but I always enjoy reading Fannie Flagg's novels and this one lived up to my expectations of an interesting, entertaining story. As you might have guessed, The All-Girl Filling Station's Last Reunion takes place in two time periods, but Flagg switches from one to the other so seamlessly that you never get a jarred feeling or lose sense of what is going on. In fact, the parallel storylines, as you might expect, eventually come together. It was interesting watching a 60 year old woman going through another coming of age stage, but as she assimilated information about the Jurdabralinski family, she seemed to break away from the constraints of her adopted family and really come into her own. Her adopted mother, Lenore Krackenberry, is probably one of the most narcissistic characters I have ever read. She is so pretentious and feels so superior to others that she garners not sympathetic reaction throughout the book. 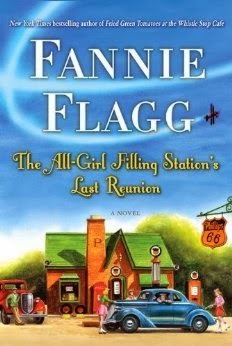 Flagg balances her novel with humor, seriousness, information, and mystery, so there is something for everyone in The All-Girl Filling Station's Last Reunion. In the last few years, a very nice body of really good fiction has begun to form around women who flew planes in World War II and this is one that definitely has a place in it. Thanks for this detailed review - this is a book I've been meaning to read! I enjoy multi-period novels and mysteries, and I'm not sure how I've missed reading Fannie Flagg's novels before. I just love Fannie Flagg's books. And she seems to like doing these multiperiod novels, which I also enjoy reading. This one has been on my TBR list since I first heard of it. Glad to hear it's as good as I anticipated. Yes, some think it is a little slow in the beginning, but it was fine as far as I was concerned. But it does get better as you go along. Unbelievable! I will have just the post for them in the near futute. Thanks fo much for letting me know able this and sending the link, Angela.